Editor's note: A woman was hit by a Caltrain in San Francisco Saturday. She survived the collision and was taken to the hospital. It was not clear what lead to her being on the tracks near 16th Street in the City at 10:30 a.m. Deaths on railroad tracks are reported regularly on the news. However, NBC Bay Area found there is no one central agency keeping track of accidents occurring on local Bay Area transit agencies’ railways, although individual railroads do so. “They end up getting themselves killed and there’s nothing you can do,” Union Pacific locomotive engineer, David Soarez told NBC Bay Area. During his 30-year career he tells NBC Bay Area, he has witnessed several people take risks near the tracks and at least ten people die while he was at the helm of the train. The Federal Railroad Administration (FRA) keeps a database of railroad accidents and fatalities that happen on tracks running through multiple states, but that doesn’t include those local public commuter lines Bay Area residents use every day. NBC Bay Area filed public records requests with five major Bay Area railways to get the number of fatalities on local tracks. Those transit agencies are: Caltrain, Bay Area Rapid Transit (BART), San Francisco Municipal Transportation Agency (SFMTA/Muni), Santa Clara Valley Transportation Authority (VTA) and Capitol Corridor. The data showed that since 2004, 229 people have died on local Bay Area tracks. The data shows Capitol Corridor with the most accidents in the 8-year period and they categorize most of them as trespassers. The data also shows fluctuations across the board year by year in numbers of deaths. According to the FRA data, which counts accidents on interstate lines, 896 people died in California during the same time frame. About fourteen percent of those - 124 accidents - happened on interstate tracks in the Bay Area. Just this year so far, there have been 67 deaths on Interstate highway rails and other railroads in California. Across the nation this year there have been 430 fatal accidents on Interstate railways, many of those also due to trespassing. To see how California compared to other states, click here for complete FRA data. Many who died on local tracks were trespassing and this year there were more trespasser deaths in California than any other state. David Ragland with the Safe Transportation Research and Education Center (SafeTREC) at UC Berkeley explained the greater number of deaths because of the relationship between population and train tracks. Ragland has analyzed a decade of rail-crossing video and has observed the extreme risks people take near the tracks. For example, some drivers attempt to outrun trains at the last minute. To view more of the close call video watch below. To prevent these close calls, Ragland thinks the answer lies in additional fencing and barriers. He believes that will deter people and cars from making efforts to access the rails. NBC Bay Area spoke with David Kutrosky, the managing director of Capitol Corridor Line, an intercity passenger train system made up of 170 miles of rail running through eight Northern California counties, from Santa Clara to Sacramento. He said this year the highest number of fatalities have occurred on its right of way. Because of that, he said trespassing is Capitol Corridor’s top problem and priority. 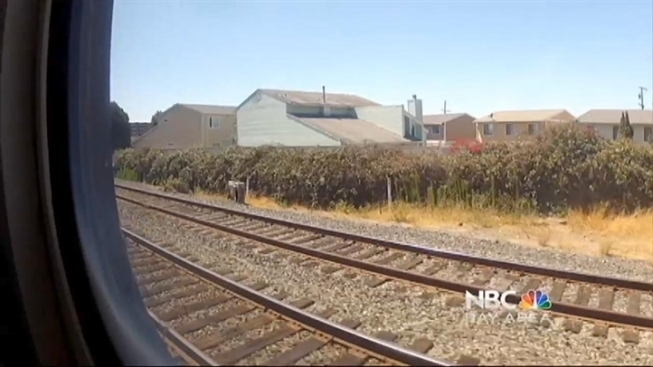 Capital corridor told NBC Bay Area it spent $1.2 million this year to add fencing. VTA did the same, adding $15 million since 2010 in increased barriers and gates at railway crossings. “You would not play on the highway, you should not play on the train tracks,” Kutrosky said. Many of the deaths are not accidental. “I think unfortunately we are dealing with a mental health societal issue,” Chuck Harvey, CCO of Caltrain told NBC Bay Area. Harvey said many of the deaths on his company’s rails are suicides. All but one of the 16 deaths along Caltrain's tracks last year were ruled suicides. However, Harvey is trying to fight the problem. Caltrain installed new fencing around some of its tracks on its 50-mile route running between the South Bay and San Francisco. He also told NBC Bay Area that transit police issued over 600 citations in the last two years for trespassing. “The bottom line is we cannot stop someone who is truly intent on putting themselves in harm’s way,” Harvey said. “You just come to work and hope nothing goes wrong,” locomotive engineer Soarez said. He knows all too well that there is no easy solution. “It’s painful. It’s painful to myself, it’s painful to everyone it’s happened to,” he said.